This is YouTube playlist of audio and video from 2000 Years (the first video is the full concert, pro shot, thanks to Rob Prisament for posting) (Donate to support Rob's fight against MS, here). Click icon on upper left for a list of clips. 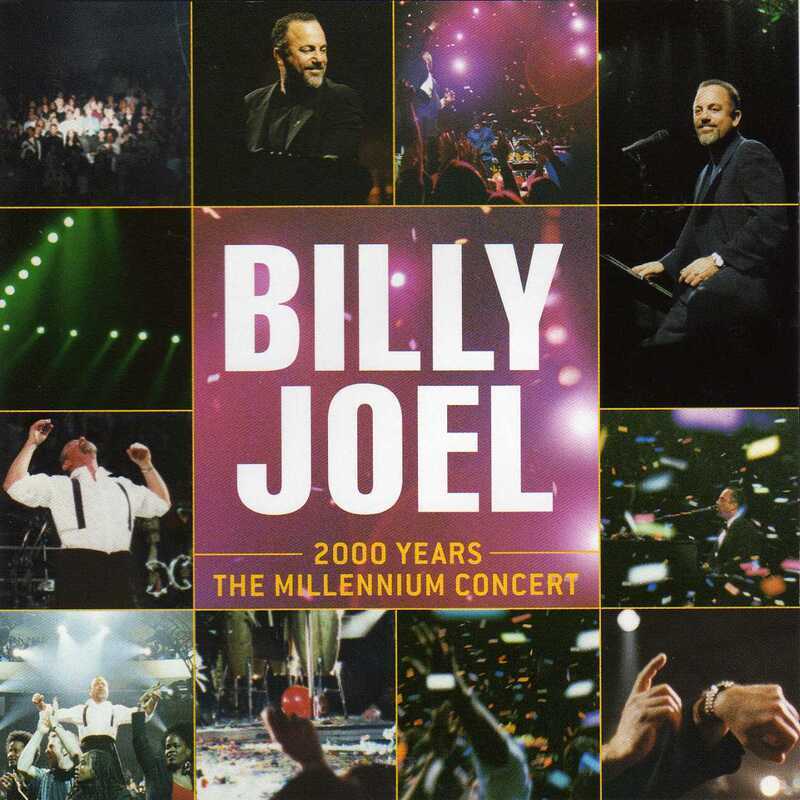 Billy helped ring in the new millennium with a marathon concert on New Year's Eve at Madison Square Garden which was later released on CD as 2000 Years: The Millennium Concert on two discs. Portions of the concert had been televised too. The selection of songs was appropriate (e.g., "2000 Years," "Summer, Highland Falls," "We Didn't Start the Fire," "Scenes From An Italian Restaurant") with the notable absence of "Piano Man" and "Souvenir" which is the perfect New Year's Eve song. The latter was performed by Billy but not included on the CD. And Billy's covers of Sly and The Family Stone's "Dance to the Music" and The Rolling Stones' "Honky Tonk Woman" were excellent. He also sang "Auld Lang Syne" of course. Billy was fifty years old at the time and didn't quite hit the high notes like he used to, though he still gives the audience their money's worth. Still, the overall album is a bit uneven with some nice versions of songs, but others which seem a little strained, like "It's Still Rock & Roll To Me." Some people have stated that Billy appeared intoxicated on New Year's Eve and that affected his performance, but probably everyone was intoxicated at that time, and it was a 3-hour concert after all. Also, fans' and critics' expectations may have been too high since Billy had not released a pop/rock studio or live album since 1993 (notwithstanding Greatest Hits III), and his latest live album was 1987's KOHUEPT. As a marker of a historic event, 2000 Years: The Millennium Concert is satisfying and complete, but six years later Billy would release a much better live concert album 12 Gardens Live. Still, here is a favorable review of 2000 Years from PopMatters' A. David Lewis. 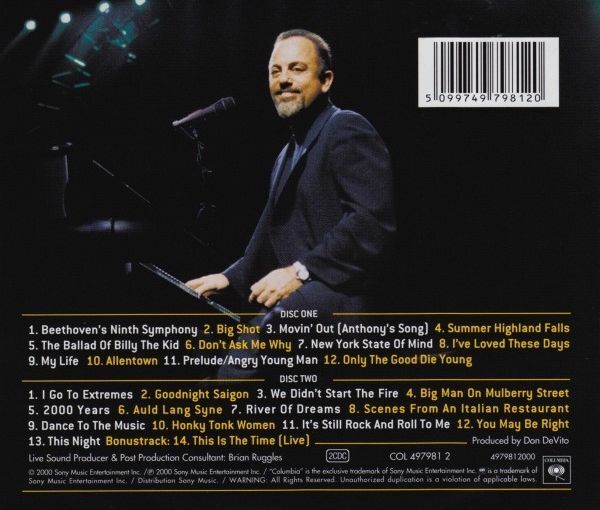 The live version of "Piano Man" from the concert is not on the album, but it can be found on The Complete Hits Collection (1973-1997). Also, a Bonus CD of the concert had live versions of "No Man's Land" and "Lullabye (Goodnight, My Angel)." ​ Although the concert was recorded on video, and parts of it were televised, it was never released on DVD. An unreleased pro shot of the concert surfaced 17 years later, see video above. One can also see an unreleased professional video done for The Millennium Concert performance of "Only The Good Die Young" here. The inside album cover photo, with the colorful swirling confetti, reminds me of the Kandinsky painting Several Circles, right. There is something mystical or cosmic about both. 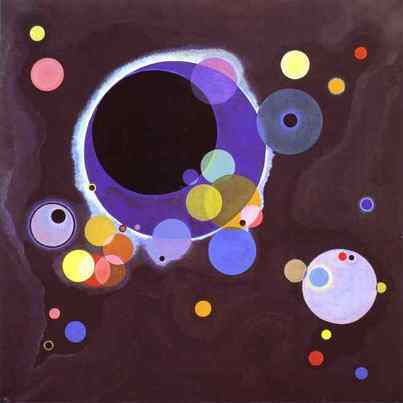 Wassily Kandinsky's "Several Circles" (1926). "Auld Lang Syne" at The Millennium Concert. Billy singing The Rolling Stones' "Honky Tonk Woman." "Scenes From An Italian Restaurant" at The Millennium Concert. 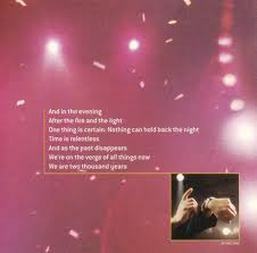 News coverage of The Millennium Concert.